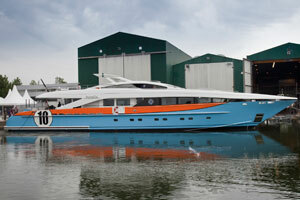 Christened Aurelia she is the tenth model in the successful 37m class built by the Dutch shipyard. She’s powered by two 16V cylinder diesel engines, giving her the ability to reach a maximum speed of 30 knots. In addition to five cabins Aurelia also has a guest cabin for the captain and more space for the crew. Comfort on board was a particular focus for the designer, especially when she’s at anchor, which is improved by a pair of Seakeeper gyro stabilisers that are incredibly efficient under all conditions. She will be on show at the Cannes Festival de la Palisance in September.